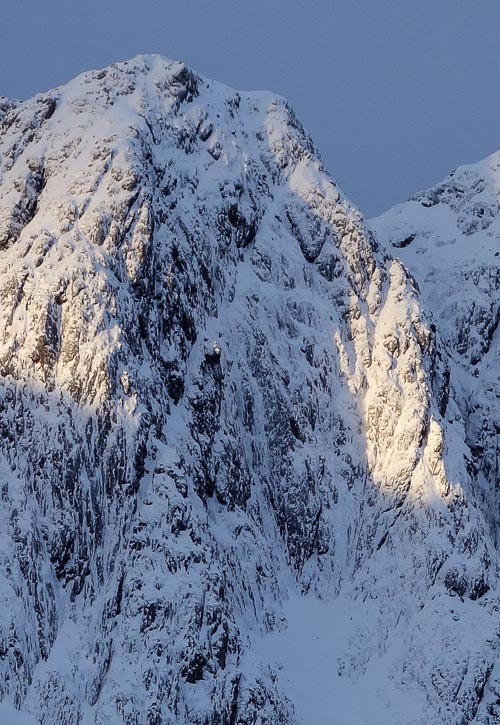 Without doubt, the 400m-high Spider Buttress on Ladhar Beinn in Knoydart is one of Scotland’s greatest winter cliffs. It’s central snowfield bears an uncanny resemblance to the Spider on the north face of The Eiger, and the cliff is sometimes described as Scotland’s Eigerwand. It’s remote situation, deep in the heart of Knoydart only adds to its aura. The buttress was first explored in the late 1970s. Andy Nisbet and Paul Tipton added the superb looking Face Route (IV,4) in February 1978, which takes the most obvious line of weakness up grooves on the right side. Two weeks later, Con Higgins and A.Foster met the full challenge of the wall by climbing the line of ice straight up its centre. Tir na Og (V,5) takes a superlative line and is one of the most coveted winter routes in the North-West Highlands. Unfortunately its remote situation and proximity to the sea means it is rarely in condition and has seen only a handful of repeats. Roger Everett and I were lucky enough to make an ascent of Tir na Og in February 1986, and ever since, I have dreamed of returning to the face. I was particularly attracted by the challenge of the steep barrel-shaped wall between Tir na Og and Face Route which has been described (rather enthusiastically perhaps) as ‘a last great problem’. Roger Webb and I were planning a route in the North-West Higlands last week but deep powder snow on the approaches made us rethink. Ladhar Beinn lies further south, and is remote and difficult to get to, but at least most of the approach is at sea level. We left the car at 7pm on February 24 and returned at 3am two days later after a 32-hour return trip (which included a four hour kip in Barrisdale bothy). Starting a big route when you’re more than seven hours away from the road feels committing, and in this case we weren’t helped by less than ideal conditions. The snow was not as consolidated as we’d hoped, the turf was aerated, and the attractive ice streaks running down the barrel-shaped wall turned out to be loose snow lying on rock. We did have a trump card though in the form of a photograph I had taken one autumn from the western side of the corrie that showed the wall was cut by a hidden diagonal slot. We were confident that once we reached that, the route would go. The crunch came on the fourth pitch where a narrow sinuous chimney led up from the Spider. Logic dictated the chimney was the way but the side walls were blank and instinct told us that we’d be better off linking the blobs of turf on its right wall. A bold and absorbing 60m pitch led to the foot of the diagonal slot which was helpfully iced, and we knew then that the route was in the bag. Three pitches later, we arrived on the summit ridge just as it was getting dark. I’d love to be able to report that Tir na Og was in good condition, but whilst it looked attractively icy from below, the ice was thin and unattached. I’d also forgotten about the rather unhelpful Ladhar Beinn mica schist. In seven pitches we just placed one nut and one cam for protection. All the other gear was bulldogs in frozen turf. This entry was posted in New Routes and tagged Ladhar Bheinn, Roger Webb, Simon Richardson. Bookmark the permalink. Just a thought, but “In seven pitches we just placed one nut and one cam for protection. All the other gear was bulldogs in frozen turf.”, was the grade not VII,6? You get my vote for the ascent of the year! Well done to the cunning experienced folks! Brilliant effort and a very inspiring adventure! I can also explain to my wife that Skye, Torridon , and the North west are not really very remote venues! That is absolutely awesome. What Erick said! PS What Andy said too. The gear sounds pretty thought-provoking to me. As a regular follower of your excellent website I have been especially impressed with your latest mammoth achievement. It seems that you have climbed a fantastic route in a really remote part of Scotland. Well done to both of you. A very well timed ascent, you guys seem to have a knack for it! On a recent trip, knowing the expected protection oppertunities, I carried 6 Warthogs and 3 Bulldogs, on top of rock gear! No doubt, if crag had still been frozen, these would have proved invaluable? How does that compare with that carried by yourselves?? What a lot of very kind commentary, thank you all. Stuart I think your rack sounds better than ours. Unaccountably, despite having done a route nearby a few years ago we managed to forget a lot of lessons. We only had four bulldogs and a terrier but got relatively lucky with spikes and stuff. I would take more bulldogs than warthogs though as the turf depth isn’t always great. Beware the rhododendrons, I got soaked on the first few hundred metres of the walk in. That’s spikes for belays not runners! Many thanks to everyone for your kind comments. Knoydart is a very special place and we lucked out on this one. Andy – Maybe it was closer to VII,6 on the day, but in icier conditions it would be easier. And Face Route looked more like a V,4? Erick – My votes for ascents of the year (so far) are Gates of Paradise and Nam Famhairean. Neil – If you take a boat, Knoydart may not feel that serious either? Stuart – As Roger says we took four bulldogs. We should have taken six. Nowadays I cut the slings off them and carry them loose. They are easier to rack that way. Daaarn! Another one off the list! Hugely well done chaps on a fine ascent in truely adventurous style. Good strategy. Good tactics. The grade of Face Route. I really can’t remember, being 38 years ago. But we gave it III/IV at the time, and Paul hadn’t climbed much in winter but managed it fine. So I’m guessing IV,3 might be nearer. I do remember we arrived at the bothy at 4am (leaving Aberdeen after work)and got up at 6am.